How many desktop images do I really need? One of the main goals with desktop virtualization is to reduce the number of required desktop images. The fewer number of images, the easier it is to support and maintain the desktop environment, which makes desktop virtualization so promising when compared to the traditional desktop approach. The goal is a single image, but oftentimes, other factors play a role in slightly increasing that number. Take, for instance, the ABC School District. The design called for 5 different desktop images, as shown in the figure. Ideally, we probably could have reduced the number of images, with the aid of application virtualization. But the school district wanted to make sure unique images were available if certain applications were later identified to be incompatible with the different forms of application virtualization (application streaming and application hosting). 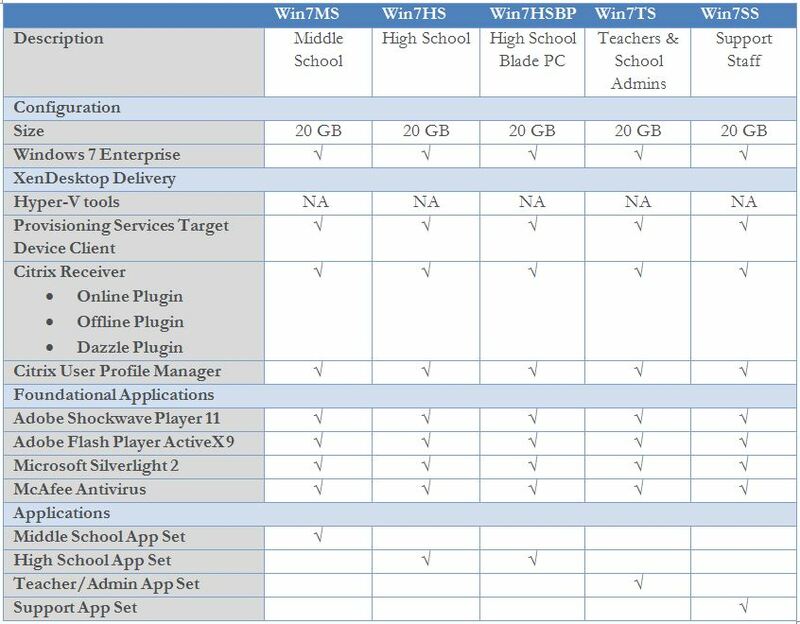 Also, it would have been possible to integrate the High School and High School Blade PCs images into a single image, but because the Blade PCs are delivered without a hypervisor, there would be variations in the device drivers (something Provisioning services can easily handle). To make the management of the images easier, it was determined to separate these images as well. So we are left with 5 images. Not bad for an environment with 20,000 end points. In one of my studies, I could create a single Windows XP image that was streamed to Desktops, BladePCs-BladeWorkstations and to Virtual Machines. Yes, one single image for different HW. The client PXE-boots off the single/streamed virtual disk image. I truly, really had only one disk image to maintain, for all my clients. And this image could be mirrored to several “virtual disk servers” in several locations. If ever some incompatibility was detected, all I would have to do was to copy my single image and install the incompatible application directly in it. Then, of course, I would have had two images to manage. But the case never occurred… Of course it was just a study, but I validated the implementation with common applications, such as MS Office, various web browsers, terminal emulation applications, database front-ends etc. and never had any incompatibility. One thing to remember though: Antivirus applications usually don’t support to be virtualized/streamed, so they had to be “in the image”. I validated the system with Norton and McAfee products and it worked OK, as were MS products (Security Essentials and Forefront Client Security).